Photo: One of our rehabilitation home residents is thriving in her newfound talents as she discovers the joys of jewelry making. Today we bring you some important updates from our work in Kampala, Uganda. First we take you to our Children’s Hope Center School in the Katoogo Slum Colony, where we provide, in conjunction with locally empowered leadership, a Kindergarten through 7th grade primary education for 138 children who would otherwise have no access to an education. All of the children are studying English, science, social studies, mathematics, writing, physical education, Luganda (one of the native languages of Uganda), and two levels of literacy classes. Thanks to your support in September, we were able to purchase chalk, pens, pencils, crayons, notebooks, and textbooks for the children last term, and after seeking to purchase a resupply of these items for the children this term, your generosity enabled us to provide all that the students need to continue to excel in their education. We continue to face some challenges at the school, mostly from damage caused to our humble facility during severe flash floods. The colony is located at the base of the Gaba hills approaching Lake Victoria, so the area is very prone to flooding during the rainy seasons. But thanks to your support once again, we were recently able to purchase the materials needed to raise the floor level of the Hope Center School high enough to prevent future flooding and add 2 additional classrooms. The surrounding neighborhood is currently suffering from flooding, but our recent foundation elevation work has protected us thus far and we are extremely grateful. 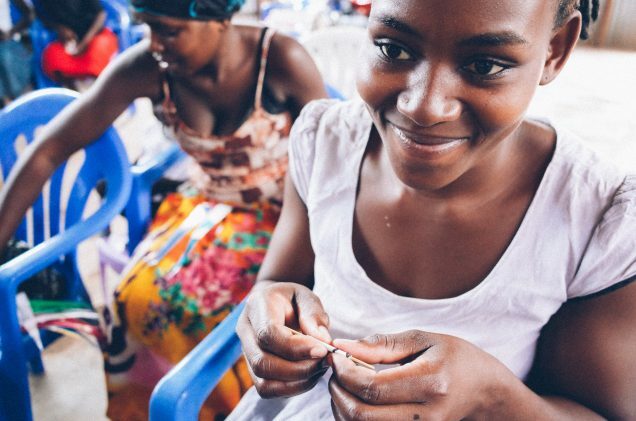 Photo inset: (Top-left): A girl living in our new Kampala ‘She Has Hope‘ rehabilitation home is learning to make paper beads as part of her skill development coursework. (Top-center): Our Kampala Children’s Hope Center gives these girls the opportunity to study writing, math, science, and many other subjects. 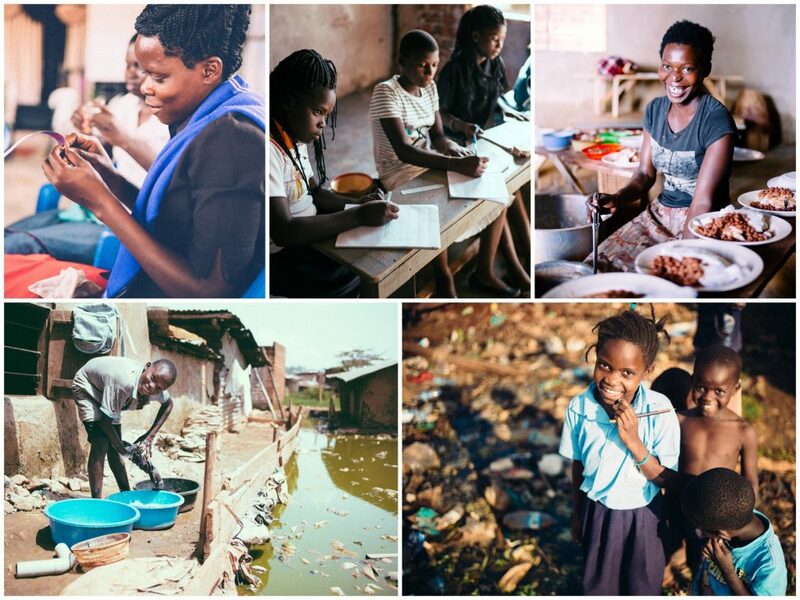 (Top-right): Our native Kampala team strives to serve three meals a day every school day for our 138 students. (Bottom-left and right): Flooding and the accumulation of sewage waste and trash are some of the many challenges faced in the colony where our Hope Center is located. As for our amazingly resilient neighbors, they deal with so many challenges, yet most are able to maintain smiles upon their faces. Life is definitely hard in the colony with so many hazards present, not to mention unemployment, crime, and disease. Sewage waste accumulating in stagnant pools scattered throughout the colony and trash strewn about everywhere has created several health problems for the residents. In addition, more and more Ugandans are slipping into poverty with the number of poor increasing from 6.6 million in 2012/13 to 10 million in 2016/17. Most of these citizens’ personal income lies below the poverty line, which is $1.25 a day, making it impossible to meet all their basic needs, and they are also unable to afford three meals a day. One contributing factor for such a continued decline in poverty in the country is that Uganda has been dealing with a widespread food crisis which began over a year ago when the country suffered a serious drought. As a result, food costs saw a doubling due to food shortages in the area. Our native team is trying to alleviate this suffering by earnestly striving to serve breakfast, lunch, and dinner to our 138 students every school day. But sadly, there are times when there is just not enough food to go around in the community. Often times children from the colony are lined up outside our Hope Center hoping to receive leftovers from lunch. We do what we can, but it is heartbreaking to know that children are going hungry all around us. Photo inset: When Kenyangi* first joined the Hope Center at 7 years old she was struggling to eat and had never been to school. Now at 12 years old she says the Hope Center has changed her life because she has been given the opportunity to study and is eating three meals a day. I joined the Hope Center at the age of seven in the middle of the school year. My life was not good, I was struggling to eat and had never been to school. I thank God so much for the Hope Center and for this opportunity for me to study. 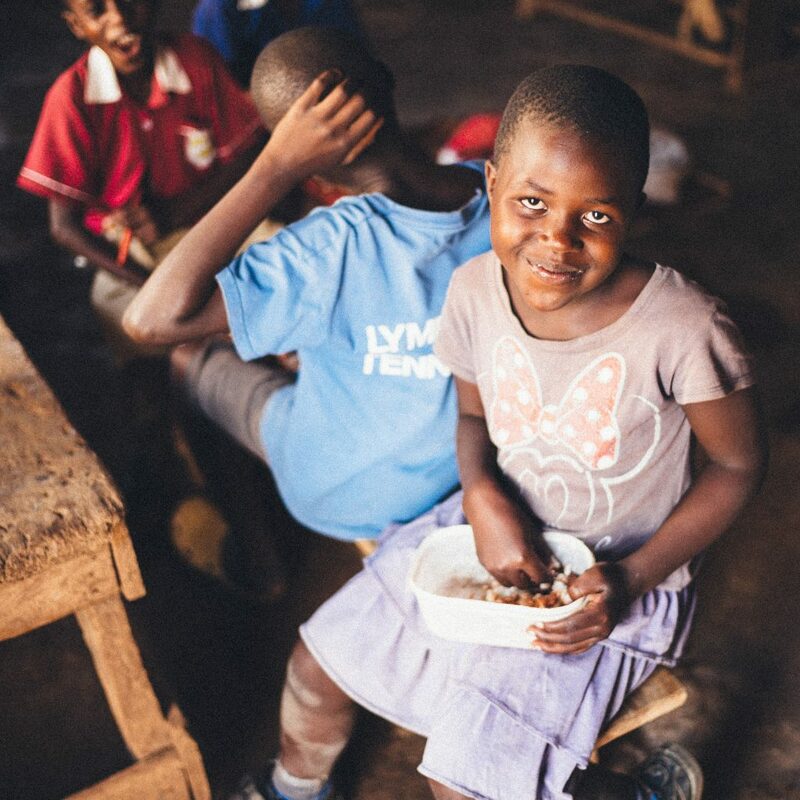 Ever since I joined the Hope Center my life has changed because now I am studying, and I eat food at breakfast, lunch, and supper. Thank God for the Hope Center and for the support they have given me. English and social studies are my favorite subjects. I like jumping rope, skipping, and handball. My favorite meal is rice with matoke [a kind of plantain]. I want to be a nurse when I grow up. I lost both my parents to a car accident when I was 4 years old, so I was staying with my aunt who is a widow. She could not afford to take me to school or feed me because she didn’t have a job. We would fall asleep hungry. Then Pastor Joseph found me and took me to the Hope Center where I am studying and he is taking care of me. In other news, our new Kampala ‘She Has Hope‘ rehabilitation home is running smoothly, being modeled after our Kathmandu, Nepal rehabilitation home, both of which empower women and girls to recover from the trauma of human trafficking. Four girls are currently enrolled at the new home in Kampala and as part of their skill development coursework they are learning to make various canisters made from banana tree fibers, and paper beads of several varieties, which are used to make necklaces, bracelets, and clutch purses sold online in our ‘She Has Hope’ crafts shop where all proceeds go toward their rehabilitation. The goal is to equip them with all the skills they need to enter the workforce as empowered citizens, fully realizing their potential, restoring them to a life full of hope.